The Endeavour Trophy is the UK’s invitation 'Champion of Champions' event held in RS200s on the river Crouch at Burnham annually every October. This year a very breezy Saturday saw testing racing and several capsizes throughout the fleet of thirty of this seasons National and World Champions. Congratulations to our RS Aero 5 representative, 15 year old RS Aero 5 and RS Feva World Champion Ben Hutton-Penman who ground out a hard earned 12th overall crewed by big brother James - a very creditable performance and the top Youth helm. Ben kept out of trouble and grafted away without being phased out by the enormity of the credentials filling out the rest of the entry list. Delighted for his opportunity to represent the class, Ben commented; “I had a brilliant time at the Endeavour Trophy representing the Aero class. It was unbelievable to be on the start line and racing against so many talented sailors and the thrill made it one of the best experiences I have ever had. My brother James and I finished 12th out of 30, which we were pleased with and we hope we represented the RS Aero class well. Thank you so much for giving us the opportunity to take part in such a great event”. After a nice 8th in Race 1 RS Aero 9 National Champion, Steve Cockerill, was hit by a port tacker at the windward mark in Race 2. The hole in the boat was too large to carry on and he and crew Sarah were forced to retire. Our 2016 RS Aero 7 Inland Champion, Drew Wright, of Chelmarsh, crewed another Youth entry for the 420 class to finish 18th. Emma Pearson, runner up at the 2017 RS Aero 5 Spring Champs, crewed the Byte class entry to 20th. 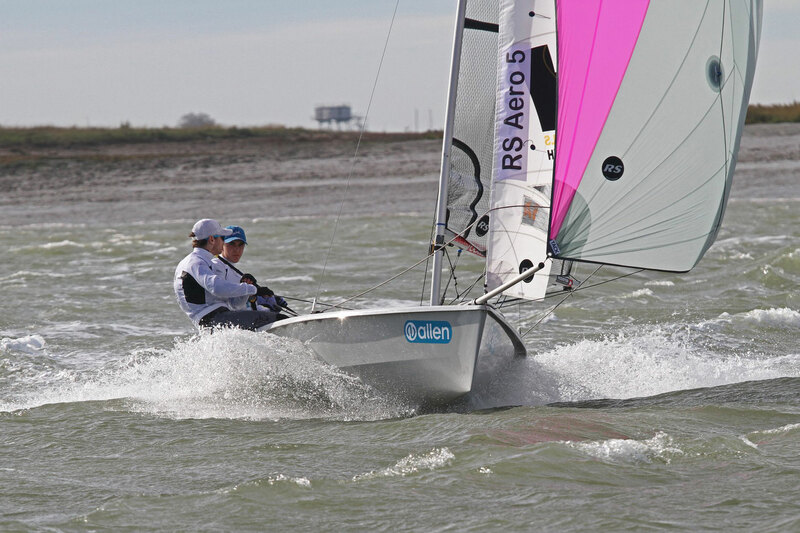 RS Aero sailors from Bowmoor, Chris Hatton and Charlie Sansom, represented the Comet class and, after troubles on Saturday, came back for some good racing on the Sunday. Following Ben Hutton-Penman’s double World Championship wins in both the RS Aero 5s and RS Fevas he has been nominated for the British Yachting Awards 2018 in the category of Youth Sailor of the Year. It is quite subjective to differentiate the achievement of winning one championship verses another, especially amongst the Youths. However, every bit as impressive as excelling on the race track was the story that won Ben the ‘Top Buddy’ accolade at the RS Aero World Championships by stopping to assist a fellow competitor in need on the long windy beat home after a long day out on Weymouth Bay. Whilst only a few sailors might manage to win races, every competitor is able to be excellent to each other. Ben achieved both to the highest standard. “Sailing back in after our last race at the end of a long day on the water I was tired and struggling with my 7 rig in the breezy, wavy conditions. Just outside the harbour entrance Ben caught up with me. He noticed how I was faring and asked whether I would prefer to sail his smaller 5 rig in, as it would be easier for me to handle. I initially declined but immediately capsized so reviewed my decision! In fact, the swap took place with me climbing into Ben's boat and him righting mine. He stayed fairly close all the way in and was very supportive. Last year the RS Aeros lost out on an award here and we are up against stiff opposition again this year. We need everyone’s vote and it takes just 27 seconds to complete online. If you believe Ben to be a deserved winner, with two 2018 World titles and his wonderfully supportive act, please support him with your vote HERE. Whilst there, do also show your support for this year's RS achievements in the other categories; the incredible RS Games (that included the mammoth 206 boat RS Aero Worlds), RS200 Champion Maria Stanley, the RS21, RS Zest and our clothing supporter, Rooster. Read the full Endeavour Trophy Report and Results.